Looking for a radio signal in a galaxy of over 400 billion worlds across 100,000 light years and billions of radio frequencies makes the proverbial needle in a haystack sound easy. Imagine you are driving home, your spouse in one car and you in the other. There’s a thick fog making visual confirmation impossible and no cell phone reception. Luckily, a week ago you had a 250 channel CB installed in both cars. Unfortunately, you forgot to agree on a broadcast channel. To chat, the two CBs would have to be on at the same time and you’d need to independently search every channel, listen, broadcast, then move to the next, hoping to get lucky enough to land on the same channel. What are the odds that would happen? Not very good. Multiply this scenario one hundred billion times and you have some idea of the challenges facing SETI. To add to that, advanced civilizations probably only stay radio active for a relatively short time in their development as they develop more sophisticated technology. Searching the radio spectrum would require looking at one frequency 24/7 for years to be sure you weren’t missing something and telescope time is far too expensive for that. While you were sitting on that single frequency, 20 extraterrestrial signals could have come in on other channels and you’d never know it. The Fermi Paradox is used by many skeptics as the holy grail when trying to prove there is nobody out there. Fermi theorized that a galaxy with so much potential for life must be full of extraterrestrials. He noted that since the majority of stars are considerably older than our sun, extraterrestrials could be millions of years more advanced than us. Fermi calculated that even at sub light speed one of those civilizations should have colonized the galaxy by now and we would have seen evidence of it. There is however a problem with that logic. In 50,000 years, humans will probably look a little different than people do now. In 10 million years, considerably different. Imagine a civilization completely different from us from the start and 10 million years more advanced. We might not even be able to recognize them as life forms, let alone see any evidence of their existence. Arthur C. Clarke once said advanced extraterrestrials would probably be indistinguishable to us from magic. Their communications would be like listening for an answer to drumbeats and getting only silence while the ether around you is filled with more information in a second than one could utter in a lifetime. There could be the alien equivalent of the super bowl going on a few light years away and we would probably not even have a clue. The distances in our galaxy are incredibly vast. Current spacecraft travel about 20 times faster than the speed of a bullet. While that sounds fast, at that speed it would take a spacecraft 75,000 years to travel to our nearest star only 4 light years away. Light years are a measure of distance so if we could speed that ship up to 186,000 miles per second (300,000 km/second), it would take 4 years to reach that same star. Looking at a star 1,000 light years away is like being in a time machine. You are not seeing it as it is now, but one thousand years ago. Our galaxy is about 100,000 light years across with over 200 billion stars. 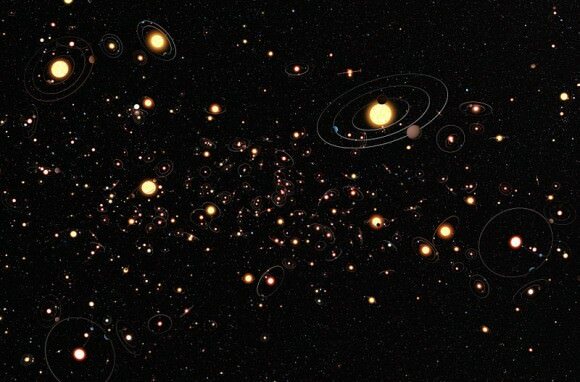 Current theory suggests there may be as many as one billion earth-like planets in our galaxy. If just one tenth of those had some kind of life, that would leave us with about 100 million worlds harboring one celled creatures or better. If just the tiniest fraction of them, (one one hundred thousandth) managed to spawn an advanced race of beings, there could be as many as 1,000 extraterrestrial civilizations in our galaxy. Regardless of whether you consider that a lot or a little, that would mean one technically advanced alien society exists for every hundred million stars. Our nearest extraterrestrial neighbor might be very, very far away. In the movies, the speculative fiction of warp speed, hyper drive and worm holes enable spaceships to travel faster than the speed of light and breach those distances fairly easily. But if the physics of this turn out to be impossible, then even the nearest alien civilizations may find interstellar travel very difficult and quite undesirable. Another reason extraterrestrials may have made themselves scarce could be that the galaxy is jam packed with all sorts of weird beings and wondrous destinations. In this scenario why would advanced forms of life want to come here? There are probably so many more interesting places to visit. It would be like hunting for an exotic bird and not even giving the ant hill below your feet a second look. Many think once a civilization achieves radio, it has a short window of but a few hundred years before it starts to integrate artificial intelligence into its own biology. Machines do everything so much easier, with far less risk and are immortal. It is entirely possible any aliens we hear from will have morphed into something more machine like than biological. There has been a push lately for SETI to expand its operations from just passively listening, to actively broadcasting messages into the cosmos. One of the smartest men on the planet, Stephen Hawking, doesn’t think that’s a good idea. He believes that our messages might attract unwanted attention from unsavory creatures looking to blast us back into the stone age. He uses what happened to the Native Americans when they first encountered Columbus as an example. Alien races may have had to endure the same aggressive survival of the fittest culture. If they are at least as smart as Stephen Hawking, then everyone out there could be listening and nobody is broadcasting for fear of attracting the equivalent of Darth Vader and the Evil Empire to their shores. Or, maybe there is a signal on its way right now, having traveled thousand of years, arriving next week, month or year. Many scientists like Paul Davies, think SETI needs to start thinking more out of the box in its search methods. He advocates analyzing places in our own solar system like the moon, planets, asteroids and the Earth for evidence that aliens have passed this way. We should also be open to the possibility that we have already received a message from the stars and don’t recognize it because it arrived by something other than radio. Physist Vladimir Charbak thinks that life may have been spread throughout the galaxy by intelligent design and there may actually be evidence of this within our own DNA just waiting to be discovered. Another reason we have yet to detect alien life could be there is nothing out there to find. Or to put it another way, we are the only game in town. To best answer that question, ask yourself, does this seem logical? There is a very good chance that one or more worlds just in our own solar system harbor some form of life. In a galaxy with as many as one billion or more potentially habitable planets, one could almost guarantee many of them will host life. There may potentially be hundreds of millions of worlds with living things on them. Does it make sense that in all that habitable real estate we are the only race to evolve into an intelligent species? We humans tend to think of things with a distinctly anthropomorphic spin. Notions like, life needs water, oxygen and is based on carbon. Or, an advanced alien race would use radio and their signals should repeat. In popular culture, extraterrestrials portrayed in movies look remotely like us. This is done so we can recognize emotions and that fills movie theaters. I can remember aliens portrayed in the classic science fiction television show, “The Outer Limits” as energy balls, dust motes and tumbleweeds. They weren’t the most popular episodes, but the reality is that those portrayals are probably closer to the truth than ET and his heart lamp. Extraterrestrials will probably be as different from us as we are from a blade of grass and their motivations a complete mystery. It is very possible that the reason we haven’t found them yet is one that completely eludes our understanding at this point. If you compare the 4.5 billion year old earth to a 24 hour clock, mankind doesn’t appear until a little over a minute before midnight. Take the almost sixty years we have been looking for extraterrestrials and project that on the same clock, it probably represents only about 20 or 30 seconds worth of searching for intelligent beings who may have been around millions and perhaps billions of years longer than we have. Our passage through time is just a tiny almost imperceptible blip when compared to the evolution of our galaxy. New, very powerful listening devices will be coming into operation soon as well as sophisticated instruments that will be able to analyze exoplanets atmospheres to look for hints of life. SETI will expand into new areas and scientists will be able to devote a lot more telescope time to the search as the newly funded (100MM) Project Breakthough Listen kicks into high gear. It will cover 10 times more of the sky and the entire 1-10GHz radio spectrum. There will be more powerful optical and infrared searches and it is estimated the project will generate in a day as much data as SETI produced in an entire year. Recently, Project Breakthrough Starshot was announced as well. Seeded by another 100MM by Russian Billionaire, Yuri Milner, this ambitious project seeks to send a tiny light propelled robotic spacecraft to our nearest star system, Alpha Centauri. Stephen Hawking thinks this can be accomplished within the next generation and that new technology would allow a journey of only 20 years. SETI scientist Nathalie Cabrol thinks its also time for a new approach to SETI’s search, a reboot if you will. She feels that “SETI’s vision has been constrained by whether ET has technology that resembles or thinks like us. She feels that the search, so far, has in essence been a search for ourselves. Electromagnetic fingerprints of radio transmitions carry a strong like us assumption”. She proposes involving a lot more disciplines in a redesign of the search. Astrobiology, life sciences, geoscience, cognitive science and mathematics among others. Her plan is to invite the research community to help craft a new scientific roadmap for SETI that very well may redefine the meaning of life and the cosmic search for new forms of it. Some experts say we won’t see evidence of extraterrestrials for another 1500 years. That’s the time it will take for our TV and radio signals to have reached enough stars and have the best chance to be discovered. In my opinion, I think highly advanced extraterrestrial societies already know we’re here and in about 10-15 years we’ll start getting some of the answers we’ve been looking for. Toward the end of the article author came closer to the truth: We haven’t found any aliens/alien signals, because of our anthropomorphism. We are currently looking only for the “other us” while likelihood is that our particular form of life is rare-to-unique. We need “Goldilocks zone”, maybe predominant form of life (and hence, intelligent life) emerges under more general conditions, say on cold icy worlds… Not only are we anthropomorphic in the type of life but in expectations for alien life to follow our peculiar patterns of development, wants and needs: ex “… Many think once a civilization achieves radio, it has a short window of but a few hundred years before it starts to integrate artificial intelligence into its own biology…” – must civilization pursue radio at all? Example of “drum beats and radio waves” is quite more likely, and not only due to the technological advance but due to ALIEN wants and needs and ways to do things. We must start reminding ourselves that same as on this Earth dolphins and bugs do not communicate in remotely similar ways and purposes, likelihood is that the various alien intelligent groups also have completely different means and concepts of communications (just remember SciFi Solaris and communication by the intelligent ocean there…). Finally, there is likelihood that aliens better understand general underlying natural laws of evolution than we, hiding but at distances at which they are capable defending themselves,to survive. Light speed is 186,000 mps, not 186,000,000. If you were a benign advanced civilization capable of interstellar travel you would be aware of the damage you would do to a culture by turning up and flooding us with advanced ideas and gadgets. Therefore you would do what most biologists and anthropologists do and that is disguise the fact that you are there and observing them. If you were aggressive you would just pile in and start trading phasors or advanced drives for stuff or you might just take it like the exploiters we saw in the past and continue to see today preying on weaker cultures. After all do we really care about the animals that are killed for our hamburgers? Then again they might just be looking at us as some kind of GoT TV series. Well, there is one thing that I did not observe being pointed out in this article. The fact is that one thing to consider is the undeniable piece of evidence that there is intelligent extraterrestrial life out there is because we have NOT been contacted by it yet, at least openly, to our entire planet (ergo all nations are aware of it). As paul585 pointed out, other civilizations may only want to study us, and they could not do so openly without interfering and changing us. Another point, assuming a benevolent intelligent alien race would want to visit us (even assuming they had no way to contact us before coming), they would have to consider self preservation. What’s the first thing we would do to something unknown approaching out planet with which we could not communicate? Answer: We’d shoot at it, and do everything we could to destroy it before it could get here, assuming we observed it coming. thinking of ET phone home … the ringing of a phone would definitely stand out. Previous PostPrevious What Are Magnetars? Next PostNext How Far is the Asteroid Belt from Earth?